The front porch is one the first things people see when looking at your home. A freshly refinished paint job goes a long way towards optimizing curb appeal. 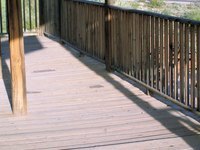 The first order of business is to strip off the old finish currently on the porch, which can be a slow and dirty job, but, once completed, can add significant value compared to what it costs you to complete. Examine the entire porch. Identify any broken, loose or missing boards and replace as necessary. Cover any plants near the porch with a sheet of plastic to help keep any chemicals off the plants and make cleanup easier. Scrape loose paint off with a steel paint scraper. Don't worry about trying to remove all of the paint. Apply paint remover onto paint that is holding fast to the wood. You don't need to apply remover to areas where there is no paint. Apply most removers using a paint brush. Allow the remover to sit on the paint the amount of time recommended by the manufacturer, usually at least one hour, to enable the chemicals to loosen the paint from the wood. Scrape off the remaining paint. You can remove most of the paint with the paint remover, but if any is left, use a heavy-grit sandpaper to sand the paint off. If there is quite a bit of paint remaining, consider using an electric sander to make the job go much faster and easier. Fill in any holes or cracks with the wood filler. Sand the entire porch with a light-grit sandpaper. Get into the corners and up against the building where paint may have built up and is harder to remove. Wash the porch with a light wood-cleaning detergent. Use the scrub brush to remove any dust or chemicals present. Spray off the porch with clean water. Let it dry at least 24 hours before doing anything else to the porch.